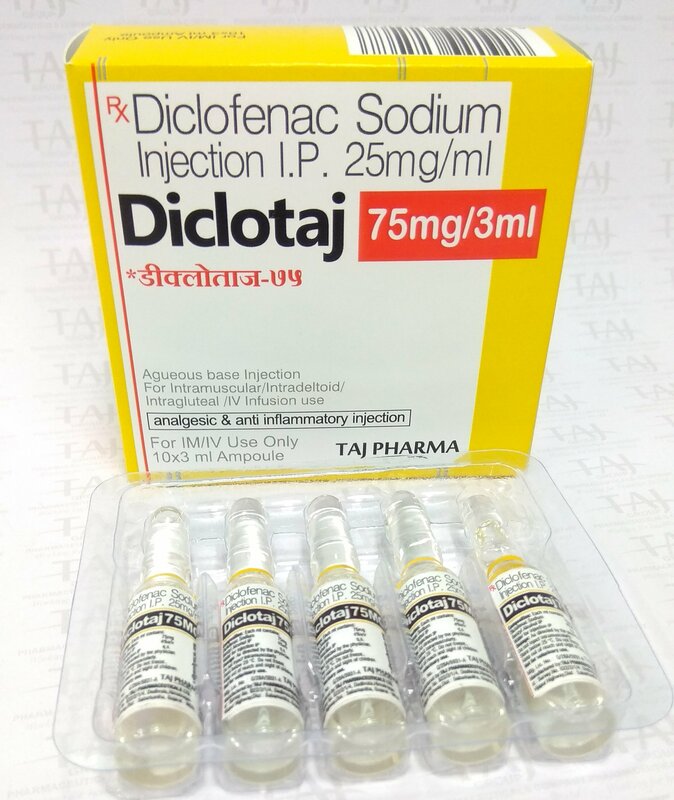 Diclofenac 25 MG Injection is a Non-steroidal anti-inflammatory (NSAID) drug used to treat pain associated with conditions like Gout, Migraine, Rheumatoid Arthritis, sprains of muscles and joints etc. In some cases, it is also used to treat mild to moderate fever. 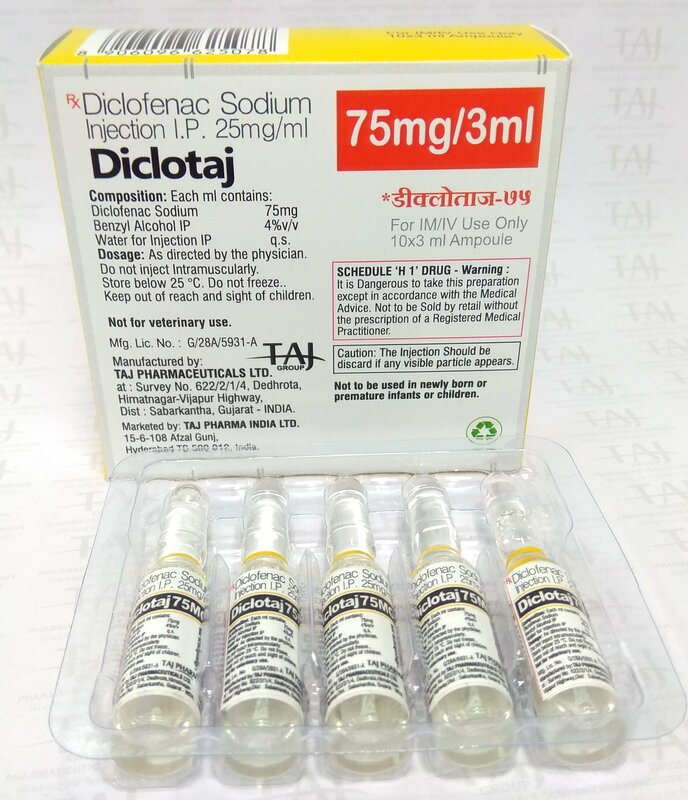 This form of diclofenac is used for the short-term treatment of pain in adults. It is usually used before or after medical procedures or after surgery. Reducing pain helps you recover more comfortably so that you can return to your normal daily activities. 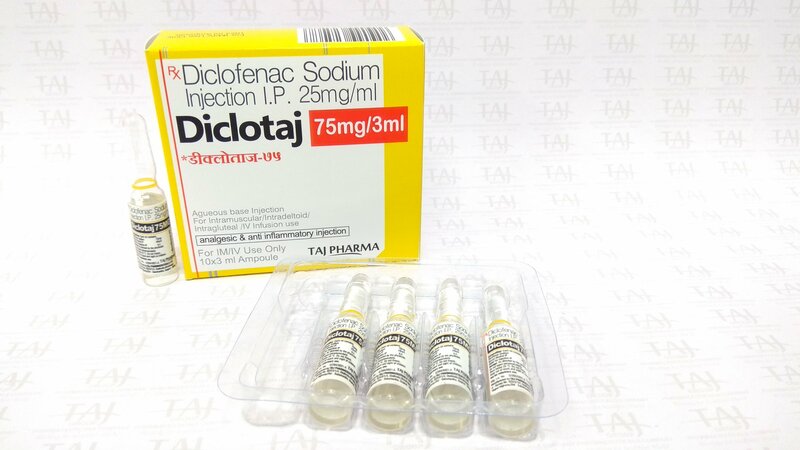 Diclofenac is known as a nonsteroidal anti-inflammatory drug (NSAID). It works by blocking your body’s production of certain natural substances that cause inflammation. This effect helps to decrease swelling, pain, or fever. This medication is given by injection into a vein as directed by your doctor, usually every 6 hours as needed. The dosage is based on your medical condition and response to treatment. 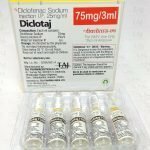 To reduce your risk of stomach bleeding and other side effects, use this medication at the lowest effective dose for the shortest possible time. Do not increase your dose or use this drug more often or for longer than prescribed. The maximum recommended dose is 150 milligrams per day. If you are using this drug “as needed” (not on a regular schedule), remember that pain medications work best if they are used as the first signs of pain occur. If you wait until the pain has worsened, the medicine may not work as well. Tell your doctor if your pain is not relieved or if it gets worse. Pain at the injection site or dizziness may occur. If either of these effects lasts or gets worse, tell your doctor or pharmacist promptly. Tell your doctor right away if you have any serious side effects, including: hearing changes (such as ringing in the ears), mental/mood changes, symptoms of heart failure (such as swelling ankles/feet, unusual tiredness, unusual/sudden weight gain). Get medical help right away if you have any very serious side effects, including: signs of kidney problems (such as change in amount of urine), unexplained stiff neck. 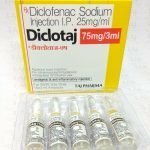 Diclofenac may rarely cause serious (rarely fatal) liver disease. Get medical help right away if you have any symptoms of liver damage, including: nausea/vomiting that doesn’t stop, loss of appetite, stomach/abdominal pain, yellowing eyes/skin, dark urine. Before using this medication, tell your doctor or pharmacist your medical history, especially of: asthma (including a history of worsening breathing after taking aspirin or other NSAIDs), blood disorders (such as anemia), bleeding/clotting problems, growths in the nose (nasal polyps), heart disease (such as previous heart attack), high blood pressure, liver disease, stomach/intestinal/esophagus problems (such as bleeding, heartburn, ulcers), stroke, swelling (edema, fluid retention). Some products that may interact with this drug include: aliskiren, ACE inhibitors (such as captopril, lisinopril), angiotensin II receptor blockers (such as losartan, valsartan), cidofovir, corticosteroids (such as dexamethasone, prednisone), lithium, methotrexate, “water pills” (diuretics such as furosemide). This medication may increase the risk of bleeding when used with other drugs that also may cause bleeding. Examples include anti-platelet drugs such as clopidogrel, “blood thinners” such as dabigatran/enoxaparin/warfarin, among others. Check all prescription and nonprescription medicine labels carefully for other pain/fever drugs (aspirin, NSAIDs such as celecoxib, ketorolac, or naproxen). These drugs are similar to diclofenac and may increase your risk of side effects if used together. However, if your doctor has directed you to take low-dose aspirin to prevent heart attack or stroke (usually at dosages of 81-325 milligrams a day), you should continue taking the aspirin unless your doctor instructs you otherwise. Ask your doctor or pharmacist for more details. If someone has overdosed and has serious symptoms such as passing out or trouble breathing, call a poison control center right away. Indian residents can call a provincial poison control center. Symptoms of overdose may include: severe stomach pain, vomit that looks like coffee grounds. Lab and/or medical tests (such as complete blood count, liver and kidney function tests, blood pressure) may be done while you are using this medication. Keep all medical and lab appointments. Consult your doctor for more details. If you are using this drug on a regular schedule (not just “as needed”) and you miss a dose, use it as soon as you remember. If it is near the time of the next dose, skip themissed dose. Use your next dose at the regular time. Do not double the dose to catch up.